The crew members of the U.S.S. Enterprise have been clothes horses since the show debuted in 1966. We’ve seen many variations on small and big screen, on different ships and in different eras. 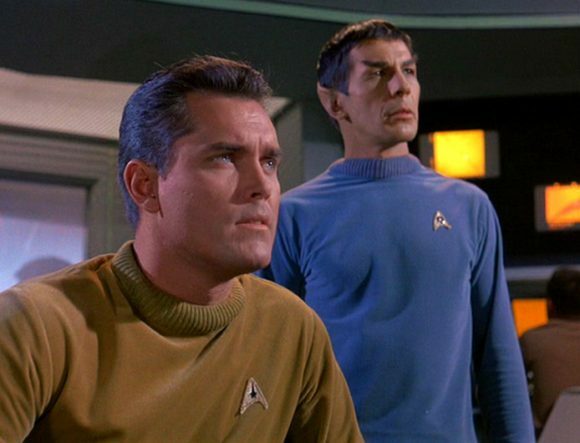 As part of STAR TREK MOVIE WEEK, my son Sam, who is our resident uniform expert, and I looked at all of them and picked our favorites. In some cases, we grouped them. In others, we picked out specific examples. We didn’t agree on everything, but we put this list together in tandem. Don’t see your fave? That’s cool. Just leave it in the comments below or in whichever social-media thread you found this! 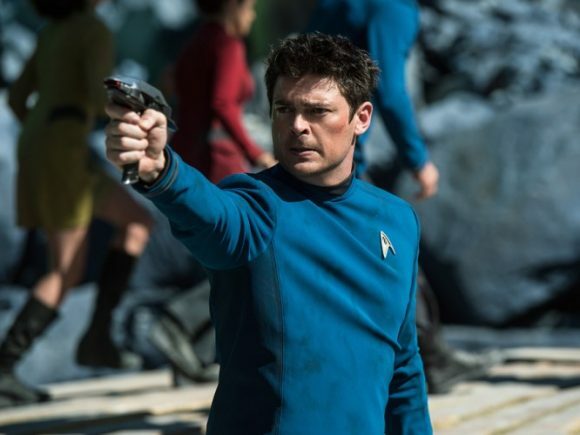 For the full STAR TREK MOVIE WEEK INDEX of features, click here. 13. 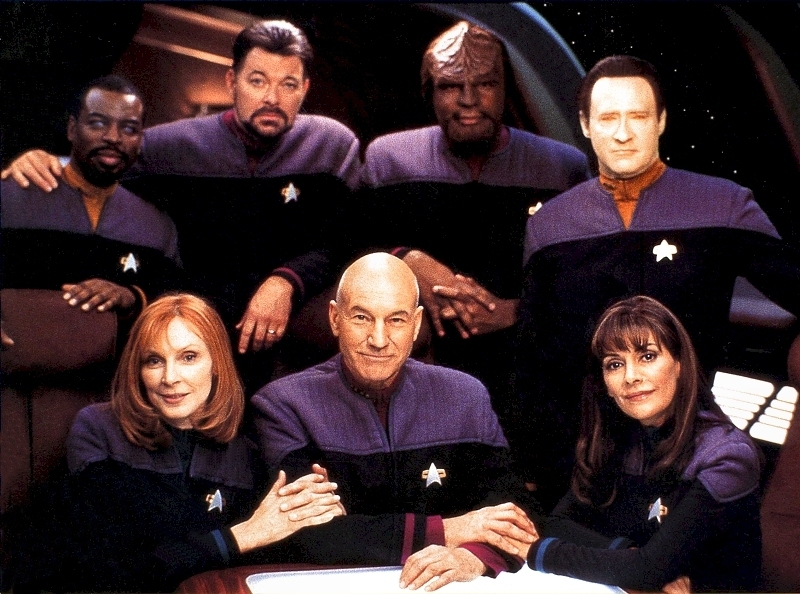 Star Trek: The Next Generation (Later Years). Also known as the ones with the gray shoulders. A little too drab for the Trek Universe. 12. The Cage. The first glimmer of what would become iconic. 11. The Animated Series. I love Filmation cartoons for their hokey and rudimentary feel. 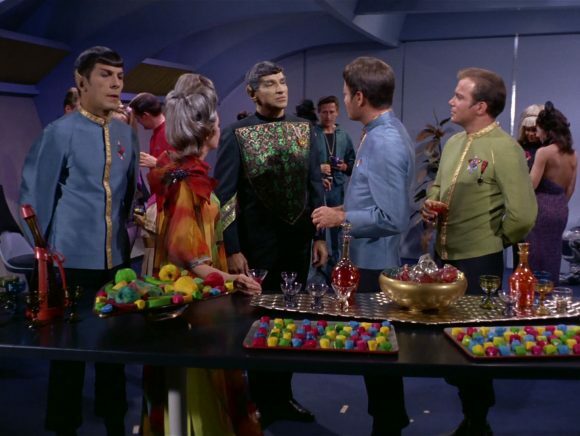 The Star Trek series, however, was more than a cut above the studio’s usual fare. Nevertheless, Filmation could always be counted to go off model — and they did with the Starfleet chest emblems, which are consistently pointed inward. It’s a charming little miss that earns them a special spot on this list. 10. Star Trek Beyond. Interesting hybrid. It’s sort of Original Series Meets Classi Next Generation. More formal than the main uniforms of the first two Kelvin Timeline films and less busy. They look a little stiff but are attractive nonetheless. 9. The Original Series: The Formals. Bones complains about them being uncomfortable in Journey to Babel, but as in #7 (below) they add that extra layer to the Star Trek universe. There are everyday uniforms and dress uniforms. It’s a subtle bit of world building. 8. 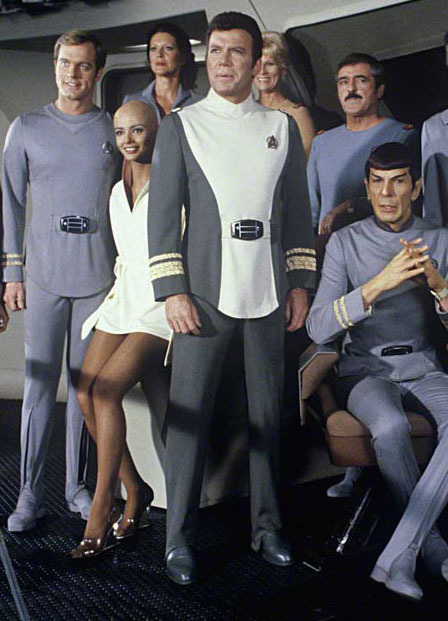 Star Trek (2009). The uniforms are great in that they use the same color scheme as the originals but add a touch of modern athleticism. 7. The Original Series: The Alternates. 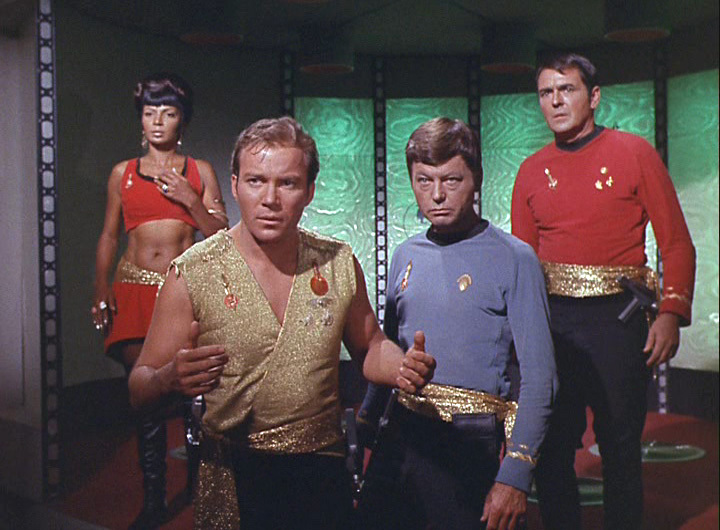 Kirk’s green wraparound and Bones’ short-sleeve doctor’s scrubs lent a subtle extra layer to the show’s visuals. Of course, the captain has options. And of course, the doctor sometimes needs more utilitarian clothes. 6. 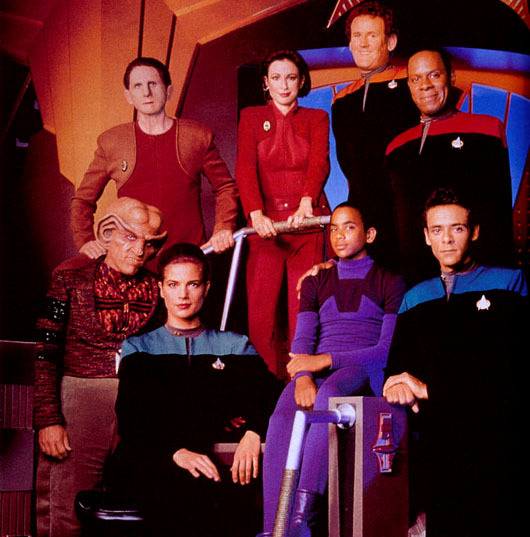 Deep Space Nine, early seasons. Basically the flip side of the TNG Season 3 design, with black in the middle and the colors along the shoulders. It’s a neat turnabout and very attractive. 5. Admiral Kirk, Star Trek: The Motion Picture. Sam would put this one at the top (as he did here), but I’m the editor and I make the rules, so I’m slotting this here. Here’s Sam’s take: The reason this uniform is so great is because it stands out from the rest of the uniforms in the movie. It’s authoritative and symbolizes Kirk’s professional growth to admiral. 4. 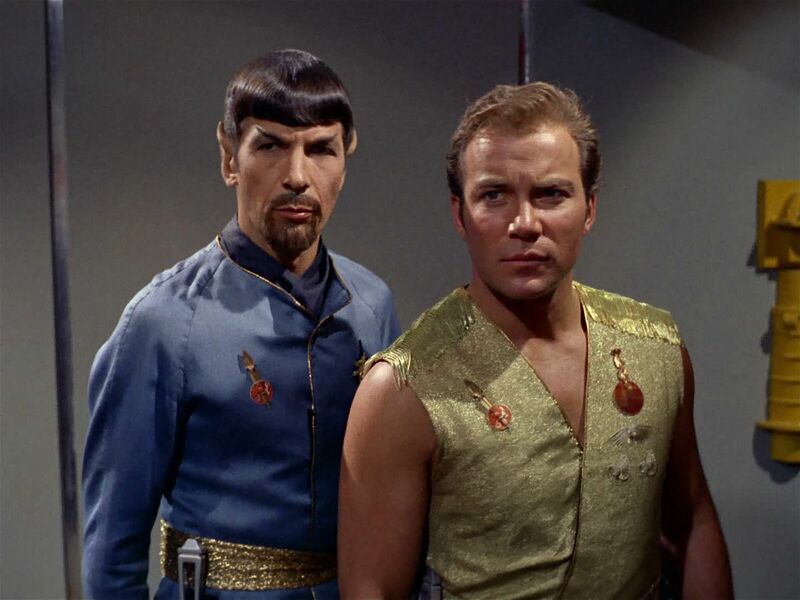 The Mirror Universe. Yeah, baby! Ga-roovy! 3. The Next Generation, Season 3. 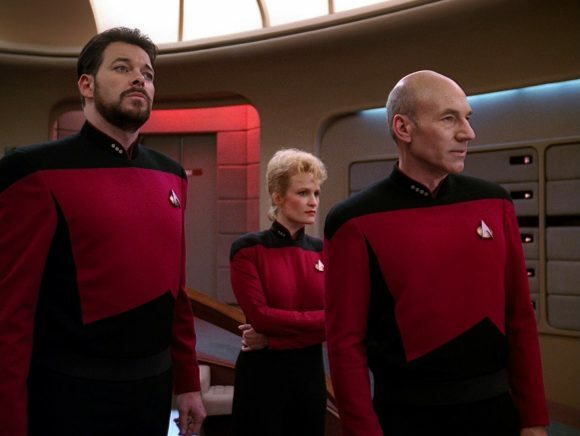 The uniforms from the first two TNG seasons always looked stiff and the actors never looked comfortable. By breaking the jumpsuit into two pieces, adding a collar and making the top more roomy, the designers created a winning design. 2. 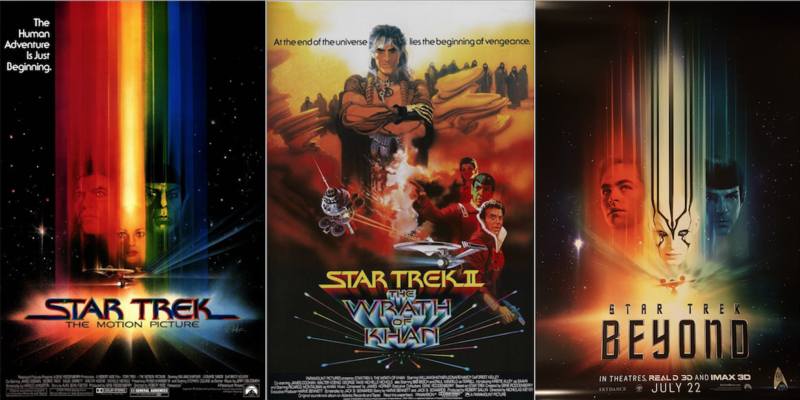 Wrath of Khan (and subsequent films). 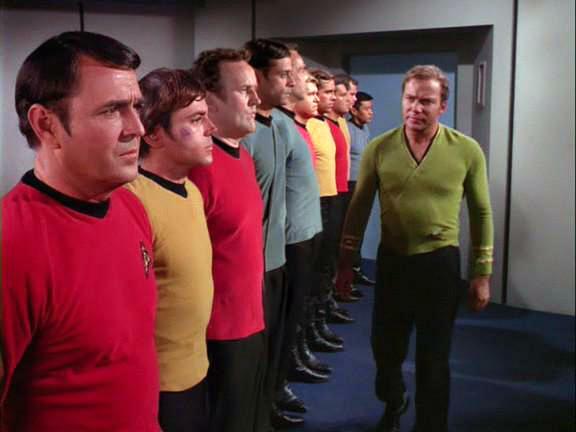 In a way, the uniforms introduced in the second Star Trek movie are the greatest of all. I just can’t bring myself to pick anything higher than the top choice below. The color coding here is more subtle but the rich burgundy tunics and black pants give the uniforms a more military feel yet they’re warm at the same time. 1. The Original Series. After a brief shakeout cruise, Gene Roddenberry and co. settled in the classic Gold, Blue and Red. 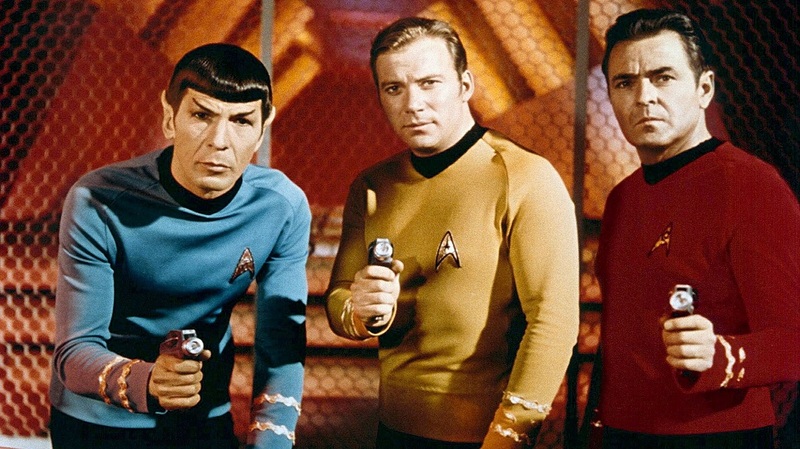 Five decades later, they’re still the Star Trek uniform against which all others are measured. 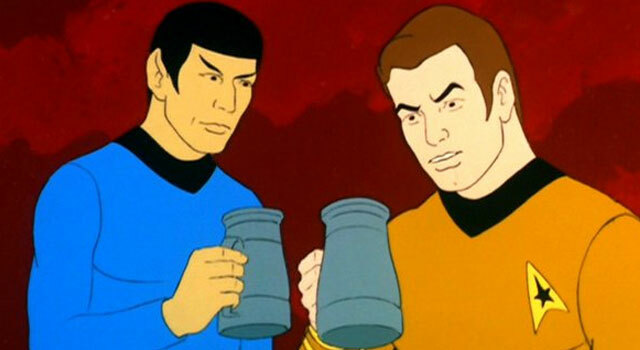 For the full STAR TREK MOVIE WEEK INDEX, click here. A lot of thought and detail went into The Wrath of Kahn uniforms, and there’s no doubt why they were shown in a six movies and a few The Next Generation episodes as well. The service pins are something that are probably overlooked by most but one of those things that if you know it’s there, you appreciate it. For some reason, the original Next Gen uniforms aren’t on the list, only Season 3 onwards. To understand the originals, you have to get that they’re a cross between the Original Series and The Motion Picture. They’ve got the jumpsuit look from Star Trek 1, combined with the color schemes of the original. But then they bollixed it up by reversing the yellow and red uniforms.